Day after day, the announcement was made “Snow detail alerted”. According to the British papers, this was the coldest and snowiest January in their history for the past forty years. Morning after morning our boys would take off in snow flurries and dense ground haze with plenty of snow on the runways. 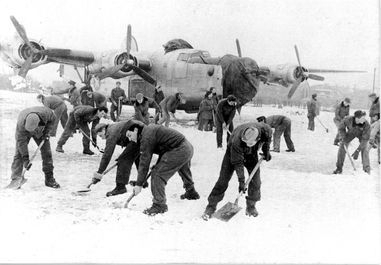 Praise should be passed on, not only to the combat personnel but to the ground staff as well who were instrumental in keeping the runways cleared, repairing the A/C and loading bombs in sub-zero weather. And so as we finish our eleventh operational [month] in the ETO, let us look back on our efforts for the month of January. Our first mission on 1 January was really a tough one. The assigned target for the day was the RR BRIDGE over the MOSELLE RIVER at GULS on the SW outskirts of KOBLENZ. A juicy target as it is an important link in Von Rundstedt’s supply line. Twenty-seven A/C were dispatched under the leadership of MAJORS LA ROCHE, BREEDING and LT WAGNER. Even at take-off we were plagued with heavy cloud coverage and it persisted along the route. When the formation was about 40 miles from the Group I.P. they ran into a terrific headwind which was computed at 180 MPH at 40 degrees resulting in a restriction to ground speed of about 20 MPH. At this point the formation was alone, and rather than buck the wind which would eventually mean a low gas supply, the decision was made to abandon the mission. Three of our A/C bombed with other groups while the rest of the formation returned the bombs to base. As it was, three of our A/C had to land on the Continent. Just another day when Old Man Weather was favoring the Hun. However, sortie credit was given as we were well into enemy territory. Still striking at the Hun’s supply line, we were airborne on the 2nd to attack another RR BRIDGE, this time the unlucky victim was situated at REMAGEN. 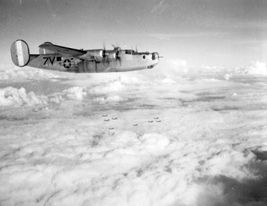 Eighteen A/C were dispatched under the leadership of LT COL WILLIAMSON and LT WILLIAMS and due to 10/10ths clouds, the 39x2000 GP’s were dropped with the aid of H2X with a visual assist. 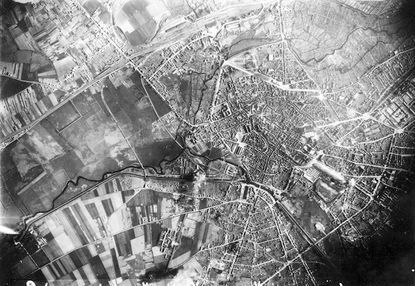 Crew’s reports and strike photos as well, failed to determine results but the “Mickey” Operator reported that everything went well and the bombardiers agree that the bombs fell in the target area. Guess we will just have to “sweat out” photo recon for the final results. 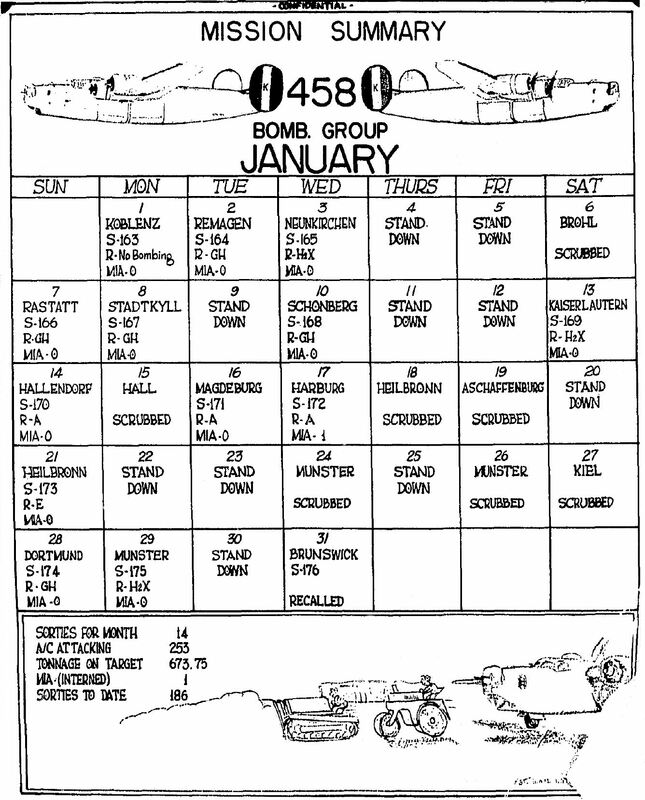 VIII AF decided, that on the 3rd, the M/Y just five miles east of NEUNKIRCHEN about two miles from the city of HOMBURG, should be honored by a visit of the 458th BG, and who are we to disappoint the higher command? So off we went into the Wild Blue Yonder with 26 A/C following the leader, our CO, COL ISBELL. The bomb run was very good. Bombs went away just 19 seconds after the smoke markers of another wing were passed which was just right. The “Mickey” Navigator reported that it was a good run, while two lead navigators reported that they have obtained GEE fixes at bombs away, which showed them right at the target. The only damn trouble with heavy clouds is that you just can’t get those good old strike photos, and although we know it to be a good run, we did not have the satisfaction of gloating over our efforts without pictures. Getting up in the world now, this makes it SORTIE 175. Before we forget it, we dropped 466x250 GP’s and 48-M17 incendiaries on the rolling stock of Adolf’s. On the 7th we continued to play havoc with their line of communication and supply by plastering the M/Y at RASTATT (right). Our formation this date, consisting of 27 A/C was led by MAJORS JAMISON, PHILLIP, and LT WAGNER flying as co-pilot with CAPT MORFORD, dropped 147x1000 GP’s with the aid of H2X. Although the Hun interfered with the H2X sets by jamming, the course was all right and the rate good. Haze over the target hindered a visual assist, but it was possible to look straight down through the haze somewhat, and bombs were seen to hit in the target area. A different type of target, namely a ROAD INTERSECTION at STADTKYLL was our assignment on 8 January, as part of the plan to interrupt Nazi communications in this sector. Once again we had to resort to instrument technique in dropping our 275x500 GP’s and RDM bombs. Twenty-four of our A/C led by COL ISBELL, MAJORS BETZOLD and BOOTH found the target through heavy layers of clouds. As a matter of fact our CO admits that he had been a bit worried when he found out how rough and gusty the air was during the critical moments of being airborne, and we feel he had a right to, as the weather was really rough. We even had to climb to 24,000 to hit the I.P., so that will give you an indication what clouds we were hitting. During critique it was brought out that if the weather scout had given a clearer picture of the weather on the route in, they would have abandoned the mission. Notwithstanding these difficulties, a good bomb run was made with all A/C dropping their bombs on time. On the route out the formation was advised by 2nd Air Division to let down west of London and come in under the clouds. The formation had a hectic flight under the clouds back to base. Many A/C called the lead and left the formation due to low gas supplies. There were only five A/C left in the formation when they finally reached base after crossing B-17 landing patterns and coming through snow squalls. We have to hand it to our combat boys for their determination not to let the weather stop them in our effort to end the war. If you are wondering what happened to the rest of the formation, let us ease your minds, all A/C returned safely, the others having landed at other bases in Yorkshire. 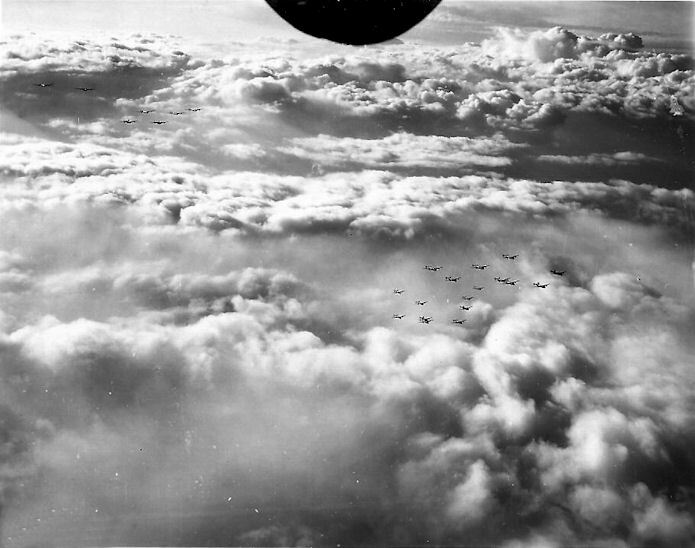 After a day of rest (courtesy of the weather) we were again over Germany in our ceaseless effort to shorten the war. Our objective this day, 10 January, was to seek and destroy the HIGHWAY BRIDGE over the Our River at SCHONBERG. A successful attack, with any hits in the immediate MPI, would considerably affect Von Rundstedt’s salient in this sector. Eighteen of our A/C led by MAJOR LA ROCHE and LT WILLIAMS, were over the target, dropping 84x1000 GP’s and 3x2000 GP’s with the aid of GH equipment. Although 8/10ths cloud prevailed over the target, the formation was good at bombs away and according to GEE fixes, they were in the target area all right. It is certain that we garnered hits in the immediate vicinity of the MPI, and as we stated above, any such hits would prove effective. However, we would rather see a target such as this assigned to fighter bombers or mediums, as it is darn difficult to hit a bridge from 23,000 feet through dense clouds. On the 13th we again had to resort to the use of instruments. Everyone is praying for a damn good visual run one of these days. We know for a fact the effectiveness of instrument bombing, but there is nothing that will build up morale in combat men than a good visual run where they can see their bombs hitting. 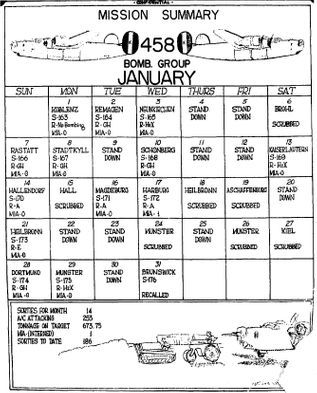 On a request from the ground forces we were dispatched to bomb the M/Y at KAISERSLAUTERN which, although attacked through 10/10ths [cloud] and severely damaged, were still in operation. Sixteen A/C attacked the primary led by MAJORS JAMISON and PHILLIP. Our lethal load dropped was 85x500 GP’s and RDX bombs. Due to the 10/10ths coverage no SAV’s were obtained but GEE fixes put the formation in the target area. Another visual was to be our luck on the 17th when we plastered the OIL REFINERY at HARBURG, high on the present oil priority list. Ten of our A/C were over the target led by CAPT LOCKRIDGE, dropping 108x500 GP’s and RDX’s with the following results: crews report hits on MPI. SAV’s show bomb pattern centered just east of MPI with bursts extending from MPI eastward. Another good day for the group. Our A/C 963T piloted by 2nd LT R. F. HICKS of the 752nd SQ. was hit in gas tank over the target. He called for fighter support and headed for Sweden. The military attaché in Sweden reports all men safe and are interned. 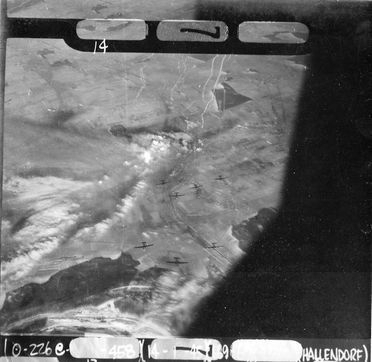 Our assigned target on 21 January was the important M/Y at HEILBRONN (right), however the formation was flying high above the contrails of the lead group and could not observe their smoke markers. [Sighting] a hole in the cloud at a target of opportunity, and realizing that the primary had been passed, the group decided to drop on the target, the town of ARNBACK, just S.E. of PFORZHEIM. 121x500 RDX’s and 3x2000 GP’s were dropped with poor results, as only a minority fell on the town itself, the others in an open field. Once again bad weather kept us aground, and it was not until the 28th that we were again airborne. Just to show the poor flying weather we were experiencing let us take a note from the notes taken at the critique: the snow flurries which came down every five or ten minutes during take-off made it an extremely difficult task. A few A/C managed to get off in each interval between flurries but a full three squadrons could not make it. 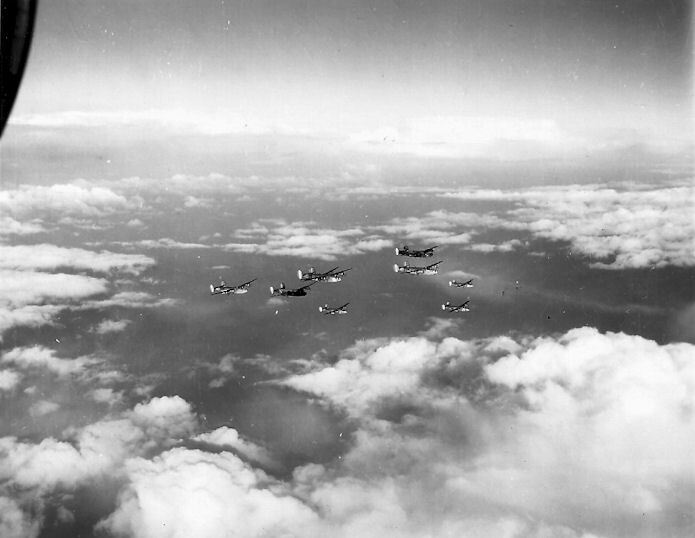 Accordingly, the scheduled three squadrons had to be consolidated into a two-squadron formation. Despite this obstacle, 15 of our A/C bombed the primary target, a COKING PLANT 4 miles NE of the city of DORTMUND. The GNEISENAU PLANT here had not been previously attacked and was fully active in producing Benzol, which is of very high value as a motor fuel on account of its high octane rating. MAJORS BREVAKIS and PHILLIP led the formation, dropping 155x500 GP’s by instrument technique with a visual assist. No SAV’s were obtained but crews reported much smoke and flame in target area, and that they had identified the target area and their bombs fell into the smoke. Another leg on our determination to eliminate the Hun’s capacity for producing oil in any shape or form. On the 29th we attacked the secondary target, the M/Y at MUNSTER. This attack was in cooperation with the ground forces request that we disrupt the Hun’s communication lines. Twenty-eight A/C were over the target led by MAJOR JAMISON, CAPT EVANS and LT ANDERSON, dropping 156x1000 GP’s and 3x2000 GP’s with the aid of H2X equipment. No SAV’s were obtained due to the 10/10ths undercast, but a good H2X run was reported by the command pilots. 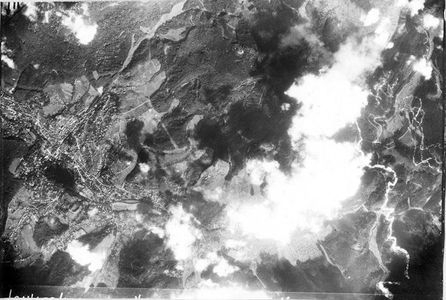 The photos above give some idea of the extreme cloud conditions that the Group (and 8th Air Force) were encountering in January1945. Inching our way down the home stretch we come to the last day of January. 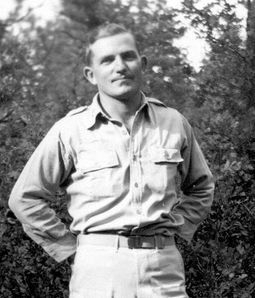 Twenty-nine A/C under the leadership of MAJORS BREEDING, ROLAND RUE (left) and LT WILLIAMS were dispatched to attack the MUHLENBAN INDUSTRIES at BRUNSWICK. This plant produces equipment for synthetic oil plants. Twenty-nine A/C were dispatched under the leadership of the above command pilots, only to be recalled when they were approximately at 52-40N and 0730E due to the poor weather over the target and en route. All A/C were diverted upon return and did not return to base until 1 February. However, sortie credit was allowed for our efforts.